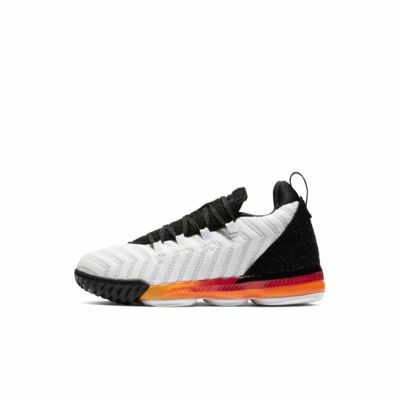 The LeBron 16 Little Kids' Shoe has a lightweight and breathable design that won't weigh you down. Soft cushioning keeps you comfy on or off the court. The LeBron 16 Little Kids&apos; Shoe has a lightweight and breathable design that won&apos;t weigh you down. Soft cushioning keeps you comfy on or off the court. Fabric and textile upper is stretchy and supportive. Inner sleeve hugs your foot for a sock-like feel. Herringbone pattern on the outsole adds traction. Light weight aero dynamic design!! Bred in color, while representing the G.O.A.T. !